This is my Christmas card for my big cousin Heidi. 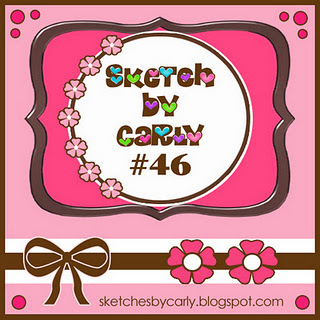 I got the sketch from Sketches by Carly. 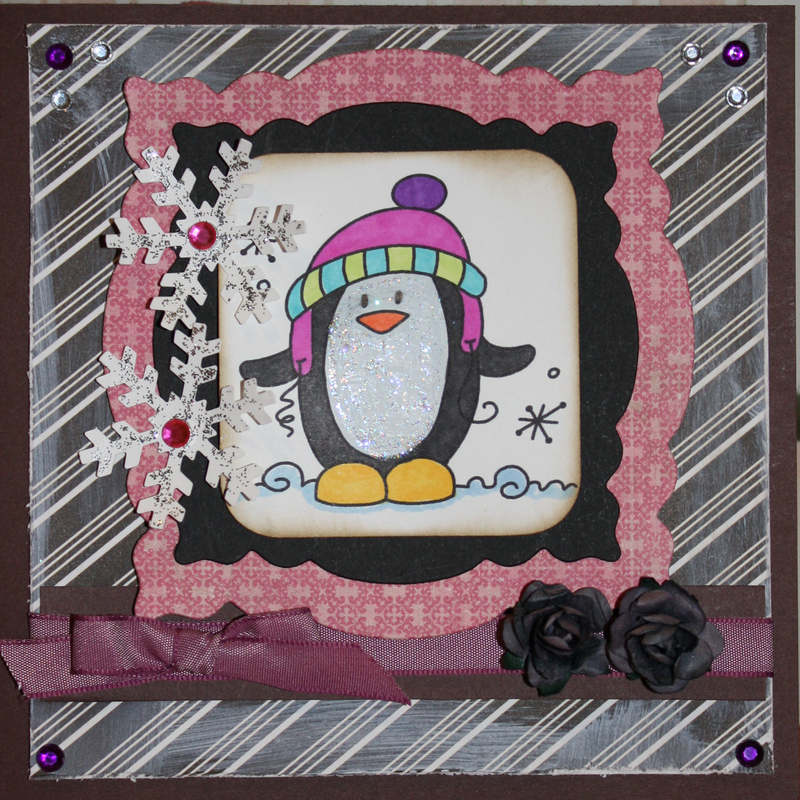 The penguin has glitter on it's belly and the snowflakes do too. I had a lot of fun colouring this while my Mum was colouring for her Christmas cards too. I used Prisma markers to colour the penguin and my Mum told me that if I keep doing this good with them then I might be able to start using copics and that would be so much fun. My Mum even showed me how to use her Big Shot machine to cut out my shapes that the penguin is sitting on. My Mum let me use her paper, ribbon, glitter, white paint, gems, snowflake punch and glitter which was so much fun because she has got so much more stuff than me! Paper Sundaes Challenge #99 Anything Christmas. Thanks for joining us at MAWTT and Good Luck in the Challenge! What a great card Izzy!!! We share all our supplies too! We love BUGABOO images and both girls used this one for a Christmas card this year too! 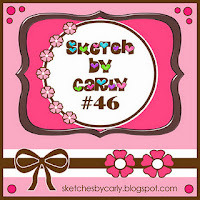 We also love Carly's Sketches!!! Such amazing talented 'little hands' there are all over the world! 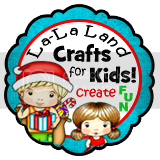 Thank - you for joining us at Little Hands Challenge Blog. Hope you will come back in a few days for an all new challenge!!! Hi Izzy! I just love Bugaboo images, and this is such a cute penguin! Your colouring is wonderful, and I love his glittering belly! 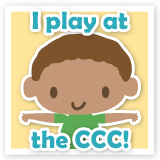 Thank you for sharing with us at For Fun Challenges! 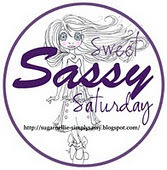 Hi Izzy - thank you for entering the drawing for my blog candy. Good luck in the draw! Your card is adorable! I love how you colored him and the bit of glitter on her tummy. Fabulous card. Love the image. 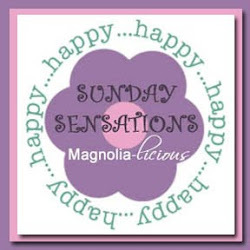 Thank you for joining in at Secret Crafter Saturday challenge. I love your card! Thanks for entering our challenge! Well how cute is this?? VERY!! Thanks for playing along with us at Sketches by Carly. Thanks for joining us at the Secret Crafter Saturday Challenge! Love your card. It's so cute. This card is so cute! I love the snowflakes and roses.